Tips on safely storing you fireworks. The first thing to remember is that Fireworks contain explosives! this might seem obvious, but you should undetstand that you are handling and storing explosives and not toys. It is not advised to store fireworks outside in sheds where they can get damp. You should also avoid anywhere with significant changes in temperatures including greenhouses, conservatories and lofts which could result in condensation. 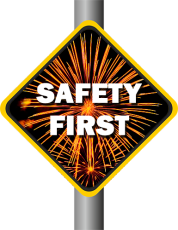 If you must keep your fireworks in the shed, wrap them up tightly in well sealed bin liners or plastic bags.